Nikon D5300 DSLR features 24.2MP DX-Format Sensor, EXPEED 4 Processor and Multi-CAM 4800DX Autofocus Sensor other features include Wi-Fi and GPS Connectivity. All lenses listed here are fully compatible with your DX format D5300 DSLR and will do Full time AF in Still and Video mode, we only have one FX format lens in our list – 50mm F1.8 for portrait purpose, Since we have no other option (no 50mm lens available for DX format camera from Nikon). But keep in mind that 50mm F1.8 lens is a AF-S Lens and it will do AF with your D5200 DSLR. Before we begin with our standard Lens recommendation I must tell you the name of best Lens I have ever used with My Nikon D5300 camera, The lens captures excellent images, the focal length of the lens covers a very essential distance and Sigma 18-35mm lens can be used for a wide variety of applications, from Landscape, Architecture or portraits. Focus is not only sharp, but extremely sharp. The bokeh is so creamy. 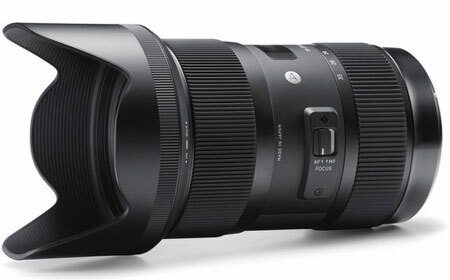 Sigma made a exceptional lens. With Nikon 18-200mm you get more range and VRII image stabilization but you have to pay more money, the lens features excellent sharpness at tele and wide end. The bokeh of this lens is nice and smooth and on the core specification side we have 2 Extra-low Dispersion (ED) elements, 3 aspherical lens elements to correct chromatic aberrations and lens aberration, other features include Zoom lock switch, Nikon Super Integrated Coating (SIC) to reduced flare. Overall the Nikon 18-200mm is best travel lens for Nikon D5300 DSLR. Nikon 55-300mm lens image quality is excellent and available at $399, the lens captures sharp images at tele+ wide-end and also comes with VRII image stabilization, The build is plasticy but inside we have 2 Extra-low Dispersion (ED) Elements to minimize to chromatic aberrations, HRI (High Refractive Index) Lens Element, New Tripod Detection Mode to stop optical IS when Tripod is used, Nikon Silent Wave Motor (SWM) for fast, accurate and quiet autofocus and 7-blade rounded diaphragm provides more natural out-of-focus blurred background. Nikon 55-300mm is Excellent Zoom Lens for Nikon D5300 DSLR. Nikon 50mm AF-S F1.8 FX Lens will work as a (50 X 1.5) 75mm lens in your D5300 DSLR due to sensor crop factor, in-return you get more working distance and creamy background blur in your images. Recommend for anyone who is beginner in photography and interested in first prime lenses for portrait and low light shooting. We have one more recommendation here, Nikon 35mm F1.8 covers more range and suitable for friends and family shooting under low light condition, you can also use Nikon 35mm as a portrait lens. Nikon 40mm f/2.8G AF-S DX is Highly recommended lens for your Nikon D5300 DSLR, the 40mm lens gives razor sharp images, excellent background blur (Bokeh) and features Nikon SWM motor for fast and accurate Auto focus. The 40mm lens can be also used for portrait and low-light photography. Nikon 10-24mm f/3.5-4.5G ED AF-S DX is the best Wide angle Lens for Nikon D5300, the 10-24mm is a DX format lens made for DX format camera like Nikon D3200 and D7100, the lens images are sharp and it captures excellent color and contrast, the lens comes with Two ED (Extra-low Dispersion) glass elements to fight with chromatic aberration and Three aspherical lens elements to minimize coma and other types of lens aberration. I have NikonD5100 with kit lense.And I want to have better lense which helps me in my photography. Which lense could you suggest me and also it should be all rounder? Does Nikon wide angle lens support Image Stabilization ? What can I find in the first package and miss it in the other ? It’s obvious that the (18-55 VRII + Nikon 55-300mm ED VR) will give you more range, the 18-140 will give you a limited range but its a perfect lens for those who travel a lot. i am planning to buy a nikon d5300 . i would like to know is 18-140mm good for beginners or are there any better options. thank you in advance. D5300 auto focusing working with Nikon 50mm AF-S F1.8 FX Lens? I already have a 35mm F/1.8, an was thinking (after a lot of readings and searches) of adding another lens 16-85mm and 70-300 mm to have a minimum gear. Do you think it is a good add, or do you suggest something else ? There 16-85mm lens is very good everyday go to lens for Nikon D5300 camera, The DX Lens is Sharp, versatile and the Build quality is great with no lens creep. The Best Everyday Zoom Lens of professional Work, the 16-80mm will cost you $300 roughly more but it gives out exceptional image quality. Better optical quality than 16-85mm lens and the Lens is sharper at all apertures from F2 through F16 , VR is also very effective. Both the lenses are very useful focal length range and will cover you 80% day to day shot. 3. . Nikon 70-300mm f/4.5-5.6G ED IF AF-S VR – As we have said already the 70-300mm is very good zoom lens for Nikon DX camera. The lens will give sharp images when used at F7-F11, bit weak performance at Max focal length. Excellent combination of price and performance. I have the nikon D5300 and an 18-55mm lens. The background bluring isn’t very sharp so i’m thinking to purchase a new lens. Which one do you suggest me to buy since i’m not a professional photographer and not a beginner. Is the sigma 18-35mm good? ( * i want a lens that has a sharp bluring effect, has a big zooming and doesn’t cost a lot😅) thank you. Yes Sigma 18-35mm lens is excellent and will create a excellent bokeh without a doubt. Nikon 35mm F1.8 and Nikon 50mm F1.8G lens will also create creamy bokeh but remember that these are prime lenses and will work with a specific range whereas the Sigma 18-35mm F1.8 lens is a zoom lens with constant aperture like a prime lens. 50mm is perfect for shooting portraits, 35mm is wide prime lens suitable for shooting family portraits. I recommend you to get 50mm for professional use. AF-S DX Nikkor 35mm f/1.8G Prime Lens is compatible with Nikon D5300. Tony both are different lens, 85mm 1.8G lens is perfect for shooting portraits and 18-200mm lens is a Zoom lens. The 18-200mm lens covers a decent focal range and a perfect travel photography lens that will cover 90% of your needs. The 85mm F1.8 lens will create creamy bokeh and will capture sharp images even at Max F1.8 aperture.